Q: So, John, first can you give a quick explanation about how Google Fiber will work? A: Sure. Here’s a basic diagram of our network. As you can see, we’ll be routing fiber connection into Kansas City, KS and Kansas City, MO through several equipment aggregator huts, aka “Google Fiber Huts.” From the Google Fiber Huts, the fiber cables will travel along utility poles into neighborhoods and homes. The benefit of this model is simple: every home that has Google Fiber service will have their very own fiber-optic cable that directly connects all the way back to the Internet backbone. A diagram of the basic Google Fiber infrastructure. Q: I see a label on your diagram, “Gigabit Symmetric Fiber Connectivity.” What does that mean? A: Well, with most standard broadband connections, it is much faster to download a file than it is to upload one of the same size. That’s because most of the bandwidth, or the network’s capacity, is devoted to the content that users are trying to view online, such as their email or streaming video on sites like YouTube. But with Google Fiber, our users will be able to download and upload files at the exact same speed. Think about being able to upload that huge powerpoint presentation you made for work, or that video of your child’s first steps in mere seconds! Q: Very cool. Now let’s get to the nuts and bolts of what’s happening right now. What are the Google Fiber construction crews busy doing? A: We’re working on 2 pieces of fiber infrastructure right now: installing fiber and building the Google Fiber Huts. Most of our crews are out on boom trucks every day, hanging fiber on utility poles throughout Kansas City. A few of our crews are also busy digging trenches to install fiber underground. We’re making good progress on the Google Fiber Huts as well—we’ve already built half of them! Q: Where exactly have the crews been working? A: We’re not focused in any one location. We’re working throughout Kansas City, KS and Kansas City, MO! Q: What’s the next step in construction? A: Well, we still have a while before infrastructure is complete. Kansas City is big, and we have to hang fiber throughout almost all of it. Once we’re done with that, we can move to the next step where we’ll be connecting fiber to homes. 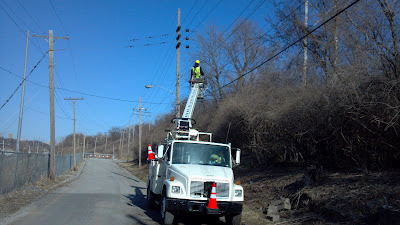 A Google Fiber crew gets ready to hang fiber cables from a Kansas City utility pole. A few weeks ago we announced that we’d started hanging fiber on utility poles throughout Kansas City, KS and Kansas City, MO. Construction is now in full swing and our crews have already hung over 100 miles of fiber! To get a better idea of how our build has been going so far, I sat down with John Toccalino, a manager on our fiber project and asked him a few questions. At Google, we push the limits of technology to improve our users’ lives. As we started thinking about fiber, we realized that there hadn’t been real innovation in the fiber world in a very long time. Although we push our bodies to do more and be more productive every day, we still rely on outdated sources of fiber and nutrients. 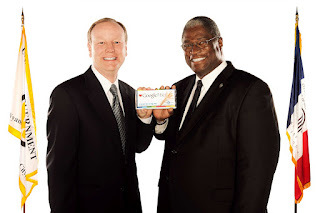 Today, after extensive testing, we’re launching Google Fiber, a nutritional bar with a smarter fiber we’ve coded as ‘Fiberlicious.’ In just 4 weeks, Google’s Fiber is able to take cues from the intestinal tract and the body’s metabolism to determine what nutritional elements are missing and deliver the appropriate dose to the specific organ that needs it. We’re proud to announce that Google Fiber will first launch in Kansas City, KS and Kansas City, MO! Google Fiber helps increase productivity, bolster efficiency and gives your body all it needs to lead a healthy lifestyle, allowing you to make the most of your health, one byte at a time. Get your own supply of Google Fiber today. Since we announced Google Fiber, we have heard a lot of rumors that we’ve been building a fiber optic network that would deliver Internet speeds 100 times faster than what most Americans have today, and while we are humbled by these speculations, we have focused our efforts on developing a different kind of fiber, Google Fiber.